A little God time is the most important part of your busy day! This one year daily devotional will encourage mothers of all ages to carve out some God time with the assurance that God is strong when we are weak. Take time out to savor the tender moments with your children. Overflow with gratitude as you reflect on the gift of motherhood. May His joy and peace be yours, embracing the grace and strength He has given you as you endeavor to love your children just as he loves you. Whether "Mom" is your only title or one of several, the day you became a mother you took on a full-time job with crazy hours, non-existent pay, and inconsistent benefits. Some days, it's the greatest gift in the world to love and serve our families. On others, we find ourselves wondering, Does this job get any easier? Any better? On those days with more responsibilities than time, more grumbling than gratitude, rest in this: your employer is not that tantrum-throwing toddler or eye-rolling teenager. God chose you specifically for this family; you were the only candidate for the job, and you are perfectly qualified. You work for Him, and He will give you all the support, recognition, and joy you need. "Whatever you do, work at it with all your heart, as working for the Lord, not for human masters, since you know that you will receive an inheritance from the Lord as a reward. It is the Lord Christ you are serving" (Colossians 3:23-24, NIV). What part of your "work" as a mother is the most difficult for you? Share your struggles with God. Does it help you to remember you are working for Him at a job He chose just for you? 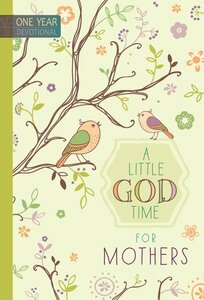 About "Little God Time For Mothers, A: 365 Daily Devotions (365 Daily Devotions Series)"
Customer Reviews For "Little God Time For Mothers, A: 365 Daily Devotions (365 Daily Devotions Series)"
This book is great for a quick devo when life is so busy. I find it invaluable to read in the morning before the chaos begins since I don't get the chance for a quiet time till the kids are in bed. I've since gifted it and my friends love it too! If you are a mother and you struggle to find time for God, this is a great devotional for you. It is very easy to follow and gives you flexibility when it comes to your devotional time. I do recommend! I find this little devotional book as invaluable for mums. Mums are always busy running around after kids and looking after the family, they rarely get any free time. This book helps us to stop for a few minutes and spend time with our God. It is a nice way to refresh and re-energise ourselves. A great devotional. A little God-time can make a big difference in your day. This one-year women's devotional provides you with godly wisdom and insight to strengthen your faith and encourage your heart. Spend a few quiet moments in the presence of God each day, and be refreshed! This deluxe year-long devotional features elegant imitation leather binding with debossed designs and gilt page edges. Inside are daily devotional reflections with Scripture, reminding you of God's never-ending mercy and power on your behalf. Convenient 17.8 x 10.8cm size.